We currently have over 65 items physically in the queue for the workbench and over 100 on the waiting list! We WANT to repair your treasured item, so please be patient! Thank you!! Do you have an old tube radio that needs repair? Did your guitar amp blow out in the Rock 'N' Roll heyday? Is your turntable more table than turn? BiState Vintage Radio Repair, LLC! Are you looking for a place to dispose of a dirty, dusty, ratty old radio that's been collecting bird droppings in your attic or garage? Bring it to us!!!!!!! No matter how old; no matter how icky; no matter what condition--we want it! Please don't destroy your old phonograph or radio. 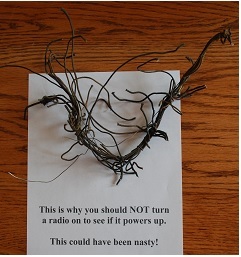 Beware of websites that say their radios are "professionally restored." This often means only the cabinet--sometimes the electronics are untouched and often dangerous. Other repair shops might change some tubes, but this is rarely the only issue that needs to be addressed with vintage electronics. and more--just about anything electronic pre-1970!! If it's old and electric, BiState Vintage Radio Repair, LLC can probably restore and resurrect it! DO NOT PLUG IT IN to see if it works. do an analysis of safety first!! These wires were in a customer's radio. It's not just the rat's nest of wiring, but the majority of the insulation has disintegrated and has left bare wires touching each other in the tangle of wiring. These capacitors were in a customer's radio. They are 320V DC and dried out. There are no electrolytic chemicals and can cause a direct short. It's impossible to know if the wiring or capacitors in your radio are in this condition without disassembling it by a qualified technician. These are wires from the audio transformer which feeds B+ high voltage to the plate of the audio output tube in a customer's Zenith record player. If these bare wires would touch the speaker, it would fry the radio, or possibly the person that might touch them. BiState Vintage Radio Repair does not use electrical tape, which can fail as in this photo. We use heat shrink on solder connections. DON'T PLUG IT IN YOURSELF!!!!!!!!!! !